Few weeks back, Gmail launched a new compose window which allow users to compose emails faster than before. It is a chat style compose window and users can also compose multiple emails simultaneously as they do multiple chats. But default size of this compose window is too small which creates problem for some users. To make our work better, we can increase the size of this chat window and force it to open in the full screen. Follow these steps to maximize the size of new compose window in chat. 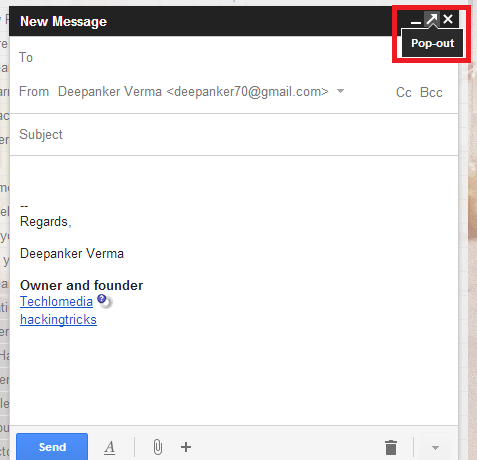 Step 1: First of all, login in your Gmail account and click on the compose button to open the compose window. Step2: Now click on the arrow icon at the top right corner of the compose box. Step3: Chat widow will not pop out as a new chrome window, that will be bigger than before. Step4: To increase size more, you can maximize window by clicking on the maximize icon at the top right corner of the window. Now enjoy a full screen chat window and compose emails without any disturbance. But composing an email in separate maximized window will reduce the power of new compose and you will not be able to compose multiple emails simultaneously. But it is nice for those who like older compose and want to enjoy features available only in the new compose. Do you like this cool tip? Let us know if this tip is helpful for you.